The Butterfly Garden was named so because of its ability to attract butterflies! Plants such as Butterfly Bush, Coreopsis, Hibiscus, Portulaca, and Zinnias, can be found here – along with a number of host plants for butterfly larva. In addition to the plantings, a water feature is available to provide liquid nourishment. 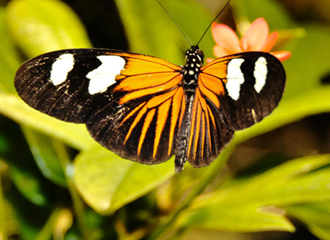 While spending only a few minutes here, you’re sure to spot several varieties of beautiful butterflies. It’s a magical atmosphere – especially endearing to children!